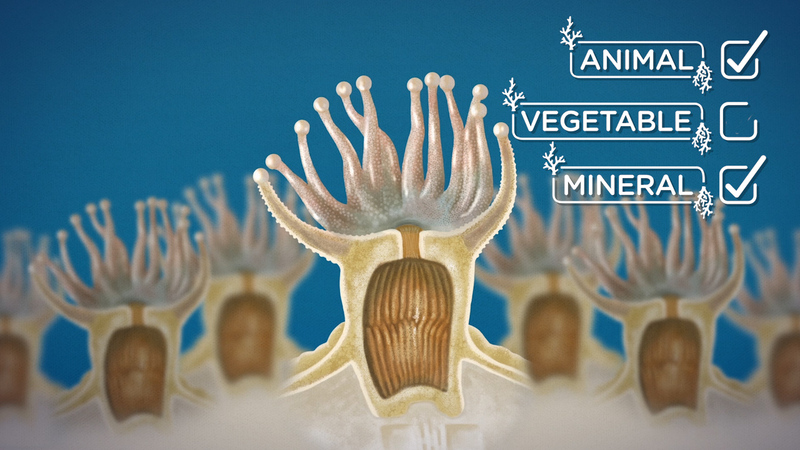 In one way of thinking, corals are part animal, vegetable, and mineral. How is that possible? There are many species of coral in the ocean, and they come in astonishing shapes, colors, and sizes. Some corals are soft, but the ones that build reefs are collectively called hard, or stony corals. They have names that match their shapes - names like “staghorn,” “elkhorn,” “table coral,” and even “brain coral.” A reef is made when many corals all grow next to and on top of each other over many, many years and this structure is filled with sand and cemented hard. We call them corals, but really each one is a coral colony, made up of many quite incredible coral organisms, called polyps. Corals are amazing organisms. If you think of the game “20 Questions” -- Animal, Vegetable, or Mineral? -- corals are all three. Corals are related to jellyfish, but they only float in the open as tiny larvae. They then anchor themselves to rocks and hard ocean floors by building a skeleton out of calcium carbonate, or limestone. These stone skeletons, incredibly, are what make up the structure of the reef. Polyps look a bit like jellyfish turned upside-down. At night, they send out tentacles to catch little bits of drifting food. But this is not how coral polyps get most of their energy. That comes from an amazing partnership between the coral and several types of algae, called Zooxanthellae. Zooxanthellae actually live inside some of the coral’s cells. Like plants they convert the sun’s light into food that gives the coral the energy to grow, reproduce, and build its stony skeleton. They also give corals their beautiful colors. The body of a coral polyp is actually almost transparent. When a coral has a healthy amount of zooxanthellae, it’s red, gold, or many colors. But when a coral gets stressed, mainly due to high temperatures, the coral expels the algae. Without the algae, the coral “bleaches” - it loses its color, and more importantly its main source of food. It becomes weak and more vulnerable to things like disease. If the water cools, corals can recover, but too long without the algae, and they’ll die. And all over the world, corals are dying, more and more often. What’s happening, and why? Let’s look for answers. The three main types of coral reefs are fringing, barrier, and atoll. The most common type of reef is the fringing reef. This type of reef grows seaward directly from the shore. They form borders along the shoreline and surrounding islands. When a fringing reef continues to grow upward from a volcanic island that has sunk entirely below sea level, an atoll is formed. Atolls are usually circular or oval in shape, with an open lagoon in the center. Barrier reefs are similar to fringing reefs in that they also border a shoreline; however, instead of growing directly out from the shore, they are separated from land by an expanse of water. This creates a lagoon of open, often deep water between the reef and the shore.